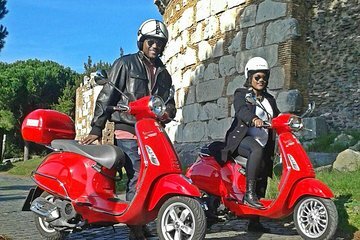 Explore Italy's capital city by Vespa along the great Apian Way, one of the most important roads of ancient Rome. Rev up your engine for this exciting tour, which leads you past early roman tombs and Christian catacombs, churches such as Domini Quo Vadis and the Circus of Maxentius, an exquisitely preserved Roman circus built between AD 306 and 312. Get out of the city center to experience the local countryside, learning about local sights and attractions from your expert guide as you go. Adolfo and our guide Alexander were very accomodating and welcoming. Alexander personalised the tour a bit more for us and took us to places we would otherwise not have gone on foot and/or on tour and provided some great history about the places. We were still limited for time, but he tried to allow us opportunity for photos too. Being on a vespa was excellent, tick. We absolutely loved our Rome Vespa tour with Victorio and Adolfo. Victorio was extremely passionate about teaching us the history of Rome and catering the tour to exactly what we wanted to see as well as taking great photos of us along the way. Adolfo was so fun and energetic as well having us pose for photos. We ended up having our own private tour and saw everything from the Vatican to the catacombs on the Appian way. That was a surprise we didn’t know we would be able to fit that tour in. At first we were ready and expecting to drive our own Vespa having gotten the international driving permits but with the traffic in the city that day I’m glad they urged us not to drive ourself. It seemed weird to have a personal driver at first but it was perfect because he was pointing out everything along the way and maneuvering around all the traffic, if we drove we wouldn’t be able to look at the sights because we would be focused on the traffic and just sitting in it loosing out on the tour time. The Vespa was the perfect way to explore everything in Rome on a time crunch by weaving around traffic. If we were in a car or bus there is no way we could have gotten to so many places in our 4 hour tour. We loved Rome and were sad to leave after our short stay. Victorio and Adolfo were very accommodating to getting us home fast through all of the traffic so we could catch our train! We will cherish these memories and remember our new Italian friends for when we come back! My boyfriend and I booked this tour the last day of our trip. We both agree that hands down this tour made our trip! Definitely the highlight. We chose this tour over some of the other Vespa tours because we were able to drive the Vespas ourselves instead of sitting on the back of someone else's Vespa. With this being said, I fully intended to drive my own Vespa but after seeing what traffic was like in Rome, I decided to ride on the back of my boyfriend's Vespa instead. He is a much more experienced driver than I so I felt more comfortable with him driving. We are both from the USA so we got our international drivers licenses for the trip of course. Our guide was fun and enthusiastic. He wanted to show us as many sites as possible. This was fun for us because we had already seen and toured around the sites that we thought were important, so when our guide showed us a whirlwind of hidden gems we felt he gave us just enough information to where we got the main idea but only spent 5-10 minutes at each spot. Our guide took us to spots we would have never seen if it wasn't for this tour. It was a fabulous adventure and I would highly recommend this tour as long as you are confident enough to drive the streets of Rome! We really loved this vespa tour our guides were the best and really gave us a feel of Rome from the locals perspective. We really enjoyed this tour and would definitely recommend it its a must do! I had so much fun on this tour and the guides were amazing! I learned so much and saw so many things I would never had seen if not for this tour. My husband and I very much enjoyed our Vespa ride with Alexandro and Adolpho. We don't believe that the description of the tour was quite accurate or that it was stressed enough that the driving would not actually be on the Appian Way. That being said, our guide Alexandro and Adolpho graciously agreed to drive us on the Vespa's and took us places we could not have gone without a vehicle. It was great fun and we loved travelling Rome the way the Romans do!